Gorillas are ground-dwelling, predominantly herbivorousapes that inhabit the forests of central Sub-Saharan Africa. 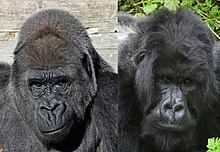 The genus Gorilla is divided into two species: the eastern gorillas and the western gorillas (both critically endangered), and either four or five subspecies. They are the largest livingprimates. The DNA of gorillas is highly similar to that of humans, from 95–99% depending on what is counted, and they are the next closest living relatives to humans after the chimpanzees and bonobos. Gorillas move around by knuckle-walking, although they sometimes walk bipedally for short distances while carrying food or in defensive situations, and some Mountain Gorillas use other parts of their hand to aid locomotion (Studies of 77 Mountain Gorillas published in 2018 showed 61% only used knuckle walking, but the remainder used knuckle walking plus other parts of their hand - fist walking in ways that don’t use the knuckles, using the backs of their hand, and using their palms). Wild male gorillas weigh 135 to 195 kg (300 to 430 lb) while adult females usually weigh half as much as adult males at 70–115 kg (150–250 lb). Adult males are 1.5 to 1.8 m (4 ft 11 in to 5 ft 11 in) tall, with an arm span that stretches from 2.3 to 2.6 m (7 ft 7 in to 8 ft 6 in). Female gorillas are shorter, with smaller arm spans. Groves (1970) calculates that average weight of the 47 wild adult male gorillas is 143 kg, while Smith and Jungers(1997) found that the average weight of the 19 wild adult male gorillas is 169 kg. 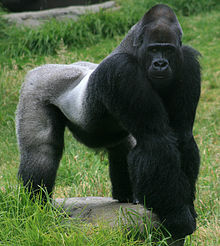 Adult male gorillas are known as silverbacks due to the characteristic silver hair on their backs reaching to the hips. The tallest gorilla recorded was a 1.95 m (6 ft 5 in) silverback with an arm span of 2.7 m (8 ft 10 in), a chest of 1.98 m (6 ft 6 in), and a weight of 219 kg (483 lb), shot in Alimbongo, northern Kivu in May 1938. The heaviest gorilla recorded was a 1.83 m (6 ft 0 in) silverback shot in Ambam, Cameroon, which weighed 267 kilograms (589 lb). Males in captivity are noted to be capable of reaching weights up to 275 kg (606 lb). 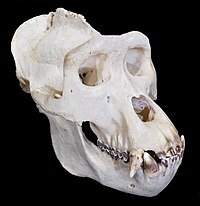 Gorilla facial structure is described as mandibular prognathism, that is, the mandible protrudes farther out than the maxilla. Adult males also have a prominent sagittal crest. A gorilla's day is synchronized, divided between rest periods and travel or feeding periods. Diets differ between and within species. Mountain gorillas mostly eat foliage, such as leaves, stems, pith, and shoots, while fruit makes up a very small part of their diets. Mountain gorilla food is widely distributed and neither individuals nor groups have to compete with one another. Their home ranges average 3–15 km2 (1.16–5.79 mi2), and their movements range around 500 m (0.31 mi) or less on an average day. Despite eating a few species in each habitat, mountain gorillas have flexible diets and can live in a variety of habitats. Eastern lowland gorillas have more diverse diets, which vary seasonally. Leaves and pith are commonly eaten, but fruits can make up as much as 25% of their diets. Since fruit is less available, lowland gorillas must travel farther each day, and their home ranges vary from 2.7–6.5 km2 (1.04 to 2.51 mi2), with day ranges 154–2,280 m (0.096–1.417 mi). Eastern lowland gorillas will also eat insects, preferably ants. Western lowland gorillas depend on fruits more than the others and they are more dispersed across their range. They travel even further than the other gorilla subspecies, at 1,105 m (0.687 mi) per day on average, and have larger home ranges of 7–14 km2 (2.70–5.41 mi2). Western lowland gorillas have less access to terrestrial herbs, although they can access aquatic herbs in some areas. Termites and ants are also eaten. Gorillas live in groups called troops. Troops tend to be made of one adult male or silverback, multiple adult females and their offspring.However, multiple-male troops also exist. A silverback is typically more than 12 years of age, and is named for the distinctive patch of silver hair on his back, which comes with maturity. Silverbacks also have large canine teeth that also come with maturity. Both males and females tend to emigrate from their natal groups. For mountain gorillas, females disperse from their natal troops more than males. 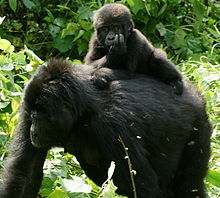 Mountain gorillas and western lowland gorillas also commonly transfer to second new groups. After World War II, George Schaller was one of the first researchers to go into the field and study primates. In 1959, he conducted a systematic study of the mountain gorilla in the wild and published his work. Years later, at the behest of Louis Leakey and the National Geographic, Dian Fosseyconducted a much longer and more comprehensive study of the mountain gorilla. When she published her work, many misconceptions and myths about gorillas were finally disproved, including the myth that gorillas are violent. Last edited by Koris; 05-15-2018 at 12:10 PM. ^ Jump up to:abGroves, C.P. (2005). Wilson, D.E. ; Reeder, D.M., eds. Mammal Species of the World: A Taxonomic and Geographic Reference (3rd ed.). Baltimore: Johns Hopkins University Press. pp. 181–182. ISBN0-801-88221-4. OCLC62265494. Jump up^Geoffroy, I. (1853). "Sur les rapports naturels du Gorille; remarques faites a la suite de la lecture de M. Duvernoy". C. R. Acad. Sci. Paris. 36: 933–936. Archived from the original on 1 March 2018. ^ Jump up to:abcdefPrince-Hughes, Dawn (1987). Songs of the Gorilla Nation. Harmony. p. 66. ISBN1-4000-5058-8. Jump up^ Müller, C. (1855–61). Geographici Graeci Minores. pp. 1.1–14: text and trans. Ed, J. Blomqvist (1979). Jump up^"A Carthaginian Exploration of the West African Coast". Archived from the original on 14 March 2017. ^ Jump up to:abcdGroves, Colin (2002). "A history of gorilla taxonomy". In Andrea B. Taylor & Michele L. Goldsmith. Gorilla Biology: A Multidisciplinary Perspective (PDF). Cambridge University Press. pp. 15–34. Archived from the original (PDF) on 26 March 2009. Jump up^Glazko GV, Nei M (March 2003). "Estimation of divergence times for major lineages of primate species". Mol. Biol. Evol. 20 (3): 424–34. doi:10.1093/molbev/msg050. PMID12644563. Archived from the original on 29 August 2009. Jump up^Goidts V; Armengol L; Schempp W; et al. (March 2006). "Identification of large-scale human-specific copy number differences by inter-species array comparative genomic hybridization". Hum. Genet. 119 (1–2): 185–98. doi:10.1007/s00439-005-0130-9. PMID16395594. Jump up^Stewart, Kelly J.; Pascale Sicotte; Martha M. Robbins (2001). "Mountain Gorillas of the Virungas". Fathom / Cambridge University Press. Archived from the original on 21 September 2008. Retrieved 11 September 2008. Jump up^Israfil, H.; Zehr, S. M.; Mootnick, A. R.; Ruvolo, M.; Steiper, M. E. (2011). "Unresolved molecular phylogenies of gibbons and siamangs (Family: Hylobatidae) based on mitochondrial, Y-linked, and X-linked loci indicate a rapid Miocene radiation or sudden vicariance event" (PDF). Molecular Phylogenetics and Evolution. 58 (3): 447–455. doi:10.1016/j.ympev.2010.11.005. PMC3046308  . PMID21074627. Archived from the original (PDF) on 10 May 2012. Jump up^Prince-Hughes, Dawn (1987). Songs of the Gorilla Nation. Harmony. pp. 82–3. ISBN1-4000-5058-8. Jump up^Thompson, Nathan E; Ostrofsky, Kelly R; McFarlin, Shannon C; Robbins, Martha M; Stoinski, Tara S; Almécija, Sergio (2018). "Unexpected terrestrial hand posture diversity in wild mountain gorillas". American Journal of Physical Anthropology. doi:10.1002/ajpa.23404. Jump up^Miller, Patricia (1997). Gorillas. p. 64. ISBN0919879896. Archived from the original on 10 May 2016. Jump up^Wood, B. A. (1978). "Relationship between body size and long bone lengths in Pan and Gorilla". American Journal of Physical Anthropology. 50 (1): 23–5. doi:10.1002/ajpa.1330500104. PMID736111. Jump up^Leigh, S. R.; Shea, B. T. (1995). "Ontogeny and the evolution of adult body size dimorphism in apes". American Journal of Primatology. 36: 37. doi:10.1002/ajp.1350360104. Jump up^Tuttle, Russell H. (1986). Apes of the World: Their Social Behavior, Communication, Mentality and Ecology. William Andrew. ISBN0815511043. ^ Jump up to:abWood (1983). The Guinness Book of Animal Facts and Feats. Sterling Publishing. ISBN978-0-85112-235-9. Jump up^Csomos, Rebecca Ann. "Gorilla gorilla western gorilla". Archived from the original on 29 October 2013. Retrieved 25 October 2013. Jump up^ Rowe N. (1996) Pictorial guide to the living primates. East Hampton (NY): Pogonias Pr. Jump up^Gamble, K. C.; Moyse, J. A.; Lovstad, J. N.; Ober, C. B.; Thompson, E. E. (2011). "Blood groups in the Species Survival Plan, European Endangered Species Program, and managed in situ populations of bonobo (Pan paniscus), common chimpanzee (Pan troglodytes), gorilla (Gorilla ssp. ), and orangutan (Pongo pygmaeus ssp.)" (PDF). Zoo Biology. 30 (4): 427–444. doi:10.1002/zoo.20348. PMID20853409. Archived from the original (pdf) on 20 January 2012. Retrieved 5 January 2012. Jump up^"Santa Barbara Zoo – Western Lowland Gorilla". santabarbarazoo.org. Archived from the original on 28 September 2006. Retrieved 10 October 2006. ^ Jump up to:ab Sarmiento EE. (2003) "Distribution, taxonomy, genetics, ecology, and causal links of gorilla survival: the need to develop practical knowledge for gorilla conservation". In: Taylor AB, Goldsmith ML (eds.). Gorilla biology: a multidisciplinary perspective. Cambridge (England): Cambridge Univ Pr. pp. 432–71. Jump up^ Ilambu O. (2001) "Ecology of Eastern Lowland gorilla: is there enough scientific knowledge to mitigate conservation threats associated with extreme disturbances in its distribution range?" In: The apes: challenges for the 21st century. Conference proceedings; 10 May 2000–13; Brookfield, IL. Chicago: Chicago Zoo Soc. pp. 307–12. Jump up^Miller-Schroeder, Patricia (1997). Gorillas. Weigl Educational Publishers. p. 20. ISBN978-0-919879-89-8. Archived from the original on 27 June 2014. Retrieved 4 July 2011. ^ Jump up to:abMarchant, Linda Frances; Nishida, Toshisada (1996). Great ape societies. Cambridge University Press. pp. 226–227. ISBN978-0-521-55536-4. Archived from the original on 27 June 2014. Retrieved 4 July 2011. ^ Jump up to:abc McNeilage A. (2001) "Diet and habitat use of two mountain gorilla groups in contrasting habitats in the Virungas". In: Robbins MM, Sicotte P, Stewart KJ (eds.). Mountain gorillas: three decades of research at Karisoke. Cambridge (England): Cambridge University Press. pp. 265–92. Jump up^Yamagiwa J, Mwanza N, Yumoto T, Maruhashi T (1994). "Seasonal change in the composition of the diet of eastern lowland gorillas". Primates. 35: 1. doi:10.1007/BF02381481. ^ Jump up to:ab Tutin CG. (1996) "Ranging and social structure of lowland gorillas in the Lopé Reserve, Gabon". In: McGrew WC, Marchant LF, Nishida T (eds.). Great ape societies. Cambridge (England): Cambridge Univ Press pp. 58–70. Jump up^GORILLAS – Diet & Eating HabitsArchived 11 August 2011 at the Wayback Machine.. Seaworld.org. Retrieved on 2011-09-27. ^ Jump up to:abcd Watts DP. (1996) "Comparative socio-ecology of gorillas". In: McGrew WC, Marchant LF, Nishida T (eds.). Great ape societies. Cambridge (England): Cambridge Univ Press. pp. 16-28. ^ Jump up to:abYamagiwa J, Kahekwa J, Kanyunyi Basabose A (2003). "Intra-specific variation in social organization of gorillas: implications for their social evolution". Primates. 44 (4): 359–69. doi:10.1007/s10329-003-0049-5. PMID12942370. ^ Jump up to:abc Robbins MM. (2001) "Variation in the social system of mountain gorillas: the male perspective". In: Robbins MM, Sicotte P, Stewart KJ, editors. Mountain gorillas: three decades of research at Karisoke. Cambridge (England): Cambridge Univ Pr. pp. 29–58. ^ Jump up to:abcStokes EJ, Parnell RJ, Olejniczak C (2003). "Female dispersal and reproductive success in wild western lowland gorillas (Gorilla gorilla gorilla)". Behav Ecol Sociobiol. 54 (4): 329–39. doi:10.1007/s00265-003-0630-3. JSTOR25063274. ^ Jump up to:ab Yamagiwa J, Kahekwa J. (2001) "Dispersal patterns, group structure, and reproductive parameters of eastern lowland gorillas at Kahuzi in the absence of infanticide". In: Robbins MM, Sicotte P, Stewart KJ (eds.). Mountain gorillas: three decades of research at Karisoke. Cambridge (England): Cambridge Univ Press. pp. 89–122. ^ Jump up to:abWatts DP. (1989). "Infanticide in mountain gorillas: new cases and a reconsideration of the evidence". Ethology. 81: 1–18. doi:10.1111/j.1439-0310.1989.tb00754.x. ^ Jump up to:ab Watts DP. (2003) "Gorilla social relationships: a comparative review". In: Taylor AB, Goldsmith ML (eds). Gorilla biology: a multidisciplinary perspective. Cambridge (England): Cambridge Univ Press. pp. 302–27. Jump up^ Watts DP. (2001) "Social relationships of female mountain gorillas". In: Robbins MM, Sicotte P, Stewart KJ (eds.). Mountain gorillas: three decades of research at Karisoke. Cambridge (England): Cambridge Univ Press. pp. 216–40. Jump up^Juichi Yamagiwa (1987). "Intra- and Inter-group Interactions of an All-male Group of Virunga Mountain Gorillas (Gorilla gorilla beringei )". Primates. 28 (1): 1–30. doi:10.1007/BF02382180. ^ Jump up to:abFossey, D. (1983). Gorillas in the mist. Boston: Houghton Mifflin Company. ISBN0-395-28217-9. Jump up^Fay JM, Carroll R, Kerbis Peterhans JC, Harris D (1995). "Leopard attack on and consumption of gorillas in the Central African Republic". Journal of Human Evolution. 29 (1): 93–9. doi:10.1006/jhev.1995.1048. Archived from the original on 3 April 2012. Jump up^Wildlife: Mountain GorillaArchived 17 February 2012 at the Wayback Machine.. AWF. Retrieved on 2011-09-27. ^ Jump up to:ab Czekala N, Robbins MM. (2001) "Assessment of reproduction and stress through hormone analysis in gorillas". In: Robbins MM, Sicotte P, Stewart KJ, editors. Mountain gorillas: three decades of research at Karisoke. Cambridge (England): Cambridge Univ Pr. pp. 317–39. ^ Jump up to:abWatts DP (1991). "Mountain gorilla reproduction and sexual behavior". Am J Primatol. 24 (3–4): 211. doi:10.1002/ajp.1350240307. ^ Jump up to:ab Sicotte P. (2001) "Female mate choice in mountain gorillas". In: Robbins MM, Sicotte P, Stewart KJ, editors. Mountain gorillas: three decades of research at Karisoke. Cambridge (England): Cambridge Univ Pr. pp. 59–87. Jump up^Tuan C. Nguyen. "Caught in the act! Gorillas mate face to face". MSN. Archived from the original on 15 February 2008. ^ Jump up to:abcdeStewart KJ. (2001) "Social relationships of immature gorillas and silverbacks". In: Robbins MM, Sicotte P, Stewart KJ, editors. Mountain gorillas: three decades of research at Karisoke. Cambridge (England): Cambridge Univ Press. ISBN0521019869. pp. 183–213. ^ Jump up to:abcStewart KJ (1988). "Suckling and lactational anoestrus in wild gorillas (Gorilla gorilla)". J Reprod Fertil. 83 (2): 627–34. doi:10.1530/jrf.0.0830627. PMID3411555. ^ Jump up to:abFletcher A. (2001) "Development of infant independence from the mother in wild mountain gorillas". In: Robbins MM, Sicotte P, Stewart KJ, editors. Mountain gorillas: three decades of research at Karisoke. Cambridge (England): Cambridge University Press. ISBN0521019869. pp. 153–82. Jump up^Harcourt, A.H., Stewart, K.J., Hauser, M. (1993). "Functions of wild gorilla 'close' calls. I. Repertoire, context, and interspecific comparison". Behaviour. 124: 89. doi:10.1163/156853993X00524. Jump up^ Maple, T.L., & Hoff, M.P. (1982). Gorilla Behavior. New York: Van Nostrand Reinhold Company. 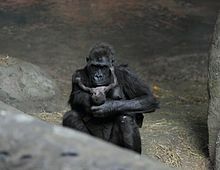 Jump up^"Columbus Zoo Announces the Death of Colo, World's Oldest Zoo Gorilla". www.columbuszoo.org. Retrieved 12 February 2018. Jump up^Planet Of No Apes? Experts Warn It's CloseArchived10 July 2012 at WebCite CBS News Online, 2007-09-12. Retrieved 2008-03-22. Jump up^Breuer T, Ndoundou-Hockemba M, Fishlock V (2005). "First Observation of Tool Use in Wild Gorillas". PLoS Biol. 3 (11): e380. doi:10.1371/journal.pbio.0030380. PMC1236726  . PMID16187795. Jump up^"A Tough Nut To Crack For Evolution". CBS News. 18 October 2005. Archived from the original on 14 November 2006. Retrieved 18 October 2006. Jump up^Savage TS. (1847). Communication describing the external character and habits of a new species of Troglodytes (T. gorilla)Archived 4 May 2016 at the Wayback Machine.. Boston Soc Nat Hist, pp. 245–247. Jump up^Savage TS, Wyman J. (1847). Notice of the external characters and habits of Troglodytes gorilla, a new species of orang from the Gaboon River, osteology of the sameArchived 20 May 2016 at the Wayback Machine.. Boston J Nat Hist 5:417–443. Jump up^McCook, S. (1996). ""It May Be Truth, but It Is Not Evidence": Paul du Chaillu and the Legitimation of Evidence in the Field Sciences" (PDF). Osiris. 11: 177–197. doi:10.1086/368759. Jump up^A History of Museum Victoria: Melbourne 1865: Gorillas at the MuseumArchived 27 February 2008 at the Wayback Machine.. Museumvictoria.com.au. Retrieved on 2011-09-27. ^ Jump up to:abQuammen, David (4 April 2013). "Book Review: Planet of the Ape - 'Between Man and Beast,' by Monte Reel". New York Times. Archived from the original on 6 April 2013. Retrieved 6 April 2013. Jump up^Van Heuverswyn, Fran; Li, Yingying; Neel, Cecile; Bailes, Elizabeth; Keele, Brandon F.; Liu, Weimin; Loul, Severin; Butel, Christelle; Liegeois, Florian; Bienvenue, Yanga; Ngolle, Eitel Mpoudi; Sharp, Paul M.; Shaw, George M.; Delaporte, Eric; Hahn, Beatrice H.; Peeters, Martine (2006). "Human immunodeficiency viruses: SIV infection in wild gorillas". Nature. 444 (7116): 164. Bibcode:2006Natur.444..164V. doi:10.1038/444164a. PMID17093443. Jump up^Plantier, Jean-Christophe; Leoz, Marie; ****erson, Jonathan E; De Oliveira, Fabienne; Cordonnier, François; Lemée, VéRonique; Damond, Florence; Robertson, David L; Simon, François (2009). "A new human immunodeficiency virus derived from gorillas". Nature Medicine. 15 (8): 871–72. doi:10.1038/nm.2016. PMID19648927. Jump up^Sharp, P. M.; Bailes, E.; Chaudhuri, R. R.; Rodenburg, C. M.; Santiago, M. O.; Hahn, B. H. (2001). "The origins of acquired immune deficiency syndrome viruses: where and when?". Philosophical Transactions of the Royal Society B: Biological Sciences. 356 (1410): 867–76. doi:10.1098/rstb.2001.0863. PMC1088480  . PMID11405934. Jump up^Takebe, Y; Uenishi, R; Li, X (2008). "Global Molecular Epidemiology of HIV: Understanding the Genesis of AIDS Pandemic". HIV-1: Molecular Biology and Pathogenesis. Advances in Pharmacology. 56. pp. 1–25. doi:10.1016/S1054-3589(07)56001-1. ISBN9780123736017. Jump up^Kate Kelland (7 March 2012). "Gorilla genome sheds new light on human evolution". Reuters. Archived from the original on 8 March 2012. Retrieved 8 March 2012. Jump up^Aylwyn Scally; Dutheil, Julien Y.; Hillier, Ladeana W.; Jordan, Gregory E.; Goodhead, Ian; Herrero, Javier; Hobolth, Asger; Lappalainen, Tuuli; Mailund, Thomas; Marques-Bonet, Tomas; McCarthy, Shane; Montgomery, Stephen H.; Schwalie, Petra C.; Tang, Y. Amy; Ward, Michelle C.; Xue, Yali; Yngvadottir, Bryndis; Alkan, Can; Andersen, Lars N.; Ayub, Qasim; Ball, Edward V.; Beal, Kathryn; Bradley, Brenda J.; Chen, Yuan; Clee, Chris M.; Fitzgerald, Stephen; Graves, Tina A.; Gu, Yong; Heath, Paul; et al. (2012). "Insights into hominid evolution from the gorilla genome sequence". Nature. 483 (7388): 169–175. Bibcode:2012Natur.483..169S. doi:10.1038/nature10842. PMC3303130  . PMID22398555. Jump up^Smith, Kerri (7 March 2012). "Gorilla joins the genome club". Nature News. Archived from the original on 9 March 2012. ^ Jump up to:ab"Four out of six great apes one step away from extinction – IUCN Red List". iucn.org. 4 September 2016. Archived from the original on 7 October 2016. Retrieved 15 September 2016. Jump up^"Gorillas infecting each other with Ebola". NewScientist.com. 10 July 2006. Archived from the original on 12 July 2006. Retrieved 10 July 2006. Jump up^"Ebola 'kills over 5,000 gorillas'". News.bbc.co.uk. 8 December 2006. Archived from the original on 29 March 2009. Retrieved 9 December 2006. Can you explain what are you doing btw ?